I've got a new card to share with you today! I used one of the adorable images from the Pumpkin Patch Cutie digi stamp set from Digi My World. I colored her up with my Copic markers and paired her with some fun Fall-themed patterned paper that I had in my stash. She's so cute, don't you think? Hope you liked my project today! Thanks so much for stopping by! Have a wonderful rest of the week! DMW: I'm here for you when the chips are down. It's my day to post over at the Digi My World blog! Today I wanted to share a card using the adorable Chips and Salsa digi stamp - aren't they the cutest pair?! I just so happen to LOVE Mexican food so this stamp was just screaming at me to be used. I couldn't wait! The sentiment is from the Food for Thought stamp set from Scrappy Moms Stamps. I thought it was just so appropriate for this little duo, don't you? I think this card is great to have on hand for those loved ones who need a special pick-me-up, without being too serious. I've got a new card to share with you today for Digi My World! Today, I'm using the little ice cream sundae image from the Kawaii Ice Cream digi stamp set! And the sentiment is from Scrappy Moms Stamps Food For Thought stamp set. Super simple card, but you all know that it's just the way I like it! If you haven't done so already, be sure to join us over at the DMW Members Gallery FB Group! Lots of fun projects from both fans and the DT are shared so I hope to see you there! It's a ton of fun! It's my first official post over at the Digi My World blog, so be sure to check it out (and leave me some love!)! If you're new to my blog - WELCOME and THANKS so much for stopping by today! I used one of the cuties from the Chibi Camera Kids digi stamp set, which, by the way is a GREAT deal for 4 images - #justsaying. 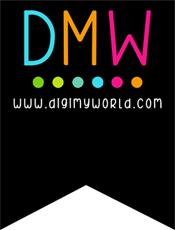 Digi My World now has Facebook FAN page. It's a place for you to share your projects made with DMW images. Come and join in the fun and be on the look out for freebies and contests. Thanks so much for stopping by and checking out my project today! Have a wonderful rest of the week! The images are so adorable and I can't wait to get started when my term begins in July! I can't wait to share my projects with you!